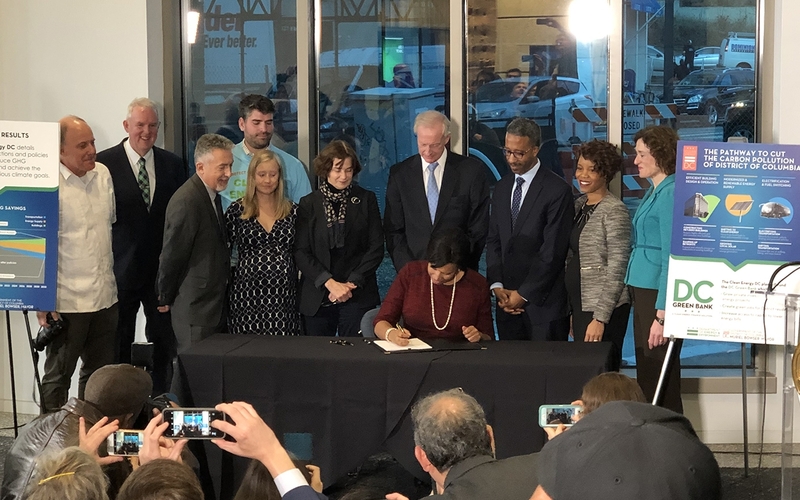 We were honored and pleased to witness DC Mayor, Muriel Bowser sign the Clean Energy DC Omnibus Act of 2018 into law today at the American Geophysical Union Headquarters building. The Clean Energy DC Omnibus Act of 2018 mandates that 100% of the city’s electricity come from renewable energy by the year 2032. The passing of this act is a dramatic step forward that commits DC to the fastest timeline to 100 percent clean electricity ahead of all states in the country. “The “Clean Energy DC Omnibus Act” is a historic piece of legislation that puts the District at the nation’s forefront in reducing greenhouse gas emissions. The fight to reduce the impacts of climate change is the most important environmental issue of our time and, if the federal government is to abandon us in this effort, then the District can serve as a model for other jurisdictions and states to follow,” said Councilmember Cheh. We are very excited about celebrating this landmark legislation and our building!